A quick jaunt after work on a pleasant winters day, taking in two small Dorset request stop stations, a pub and (a new obsession) a place called Beer. I started by catching the train at Castle Cary to Thornford. I knew I had to ask the guard to let me off at Thornford, but I struggled to get any of the train staffs attention. 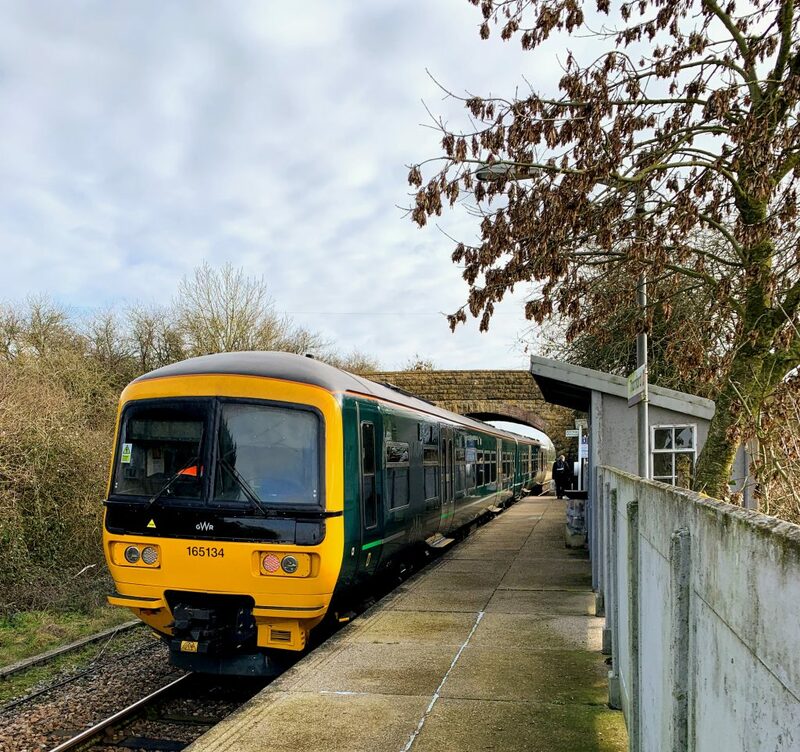 It turned out this was because they were discussing a man who had left the train at Castle Cary – after urinating out of the train doors. Alcohol can be a bad thing! I was not the only request stopper at Thornford, which was not a complete surprise. According to the usage figures there are roughly 10 entries and/or exits a day (3,448 a year). It would be a very nice place to live and commute from, and I suspect that was the reason for my fellow traveller’s departure. 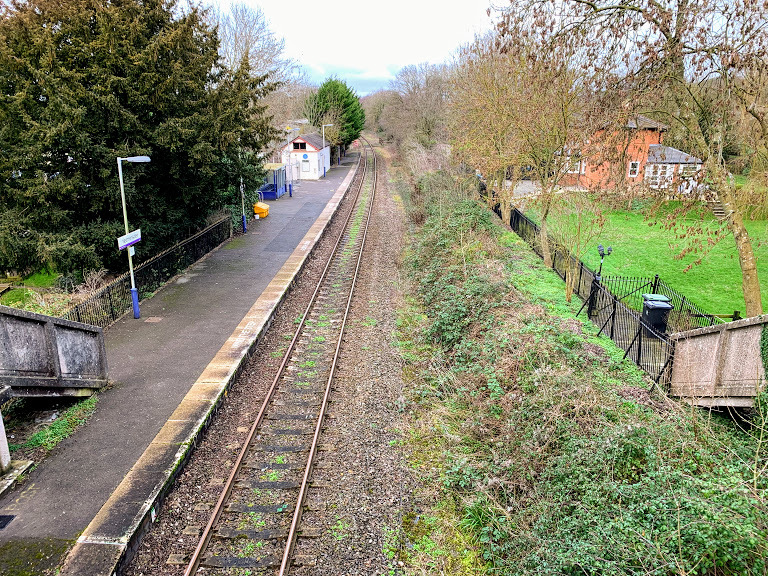 The station is about a mile from the village itself, but there is a dedicated footpath and it is a very simple walk. I only saw a small section of the village, so any judgement I make about it would be unfair. I’ll still do it though. There were lots of Range Rovers and even a Maserati. I doubt there is much affordable housing. 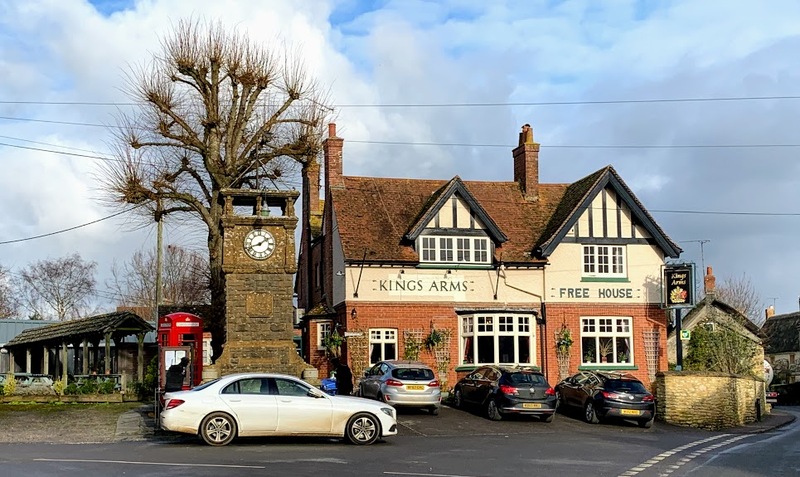 But it was very pretty, and the pub (The Kings Arms) was very good. I had a tasty pint of Dorset Rogue by Piddle Brewery. 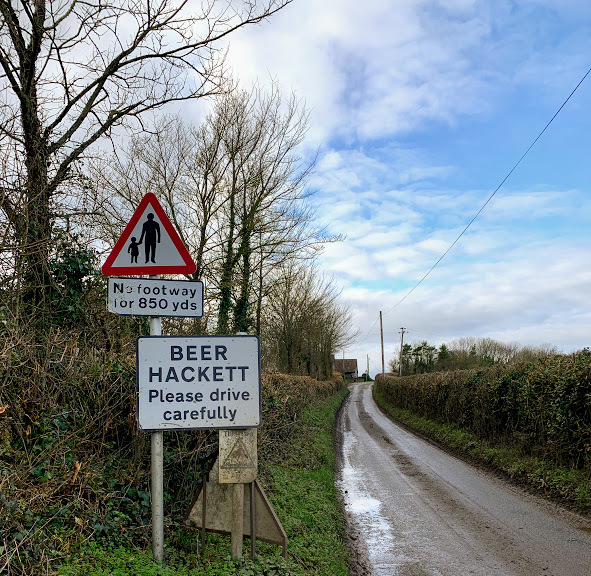 My next port of call was Beer Hackett. The route there was via two connected lanes – Horsepool Lane and Claypits Lane. I love walking along tree lined lanes like this. It is easy to imagine people tramping along them for generations, essentially unchanged now from then. Even though many modern roads follow traditional routes, they have lost that feeling. On this particular day, however, it was very soggy underfoot and the benefits of modern metalled roads were obvious. 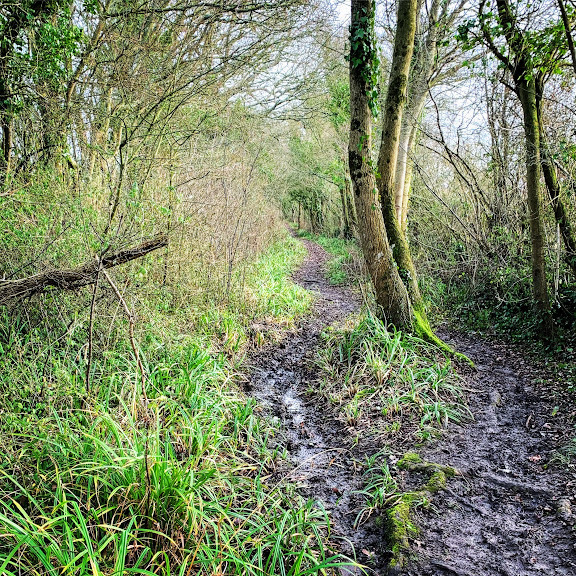 The lanes eventually lead me back to the road, just outside the village of Beer Hackett. Me being me, I immediately started wondering how many places there are called “Beer” and can I visit them all? I don’t know the answers to these questions – but expect occasional pictures of signs as I add to my collection! I didn’t hang around long in Beer Hackett, but I did visit the churchyard. The sun had come out, and the church looked splendid. I had to hurry on to catch the train, so I didn’t explore inside. Something for another day. The footpath from Beer Hackett to Yetminster crosses the railway line. I am always childishly excited at these crossings. On this occasion, I could be fairly certain there would not be any trains – the next one due would be the one I was on. Nevertheless, I sense a certain very low level danger when actually stepping over the rails, which is crazy! I arrived at Yetminster with no time left to explore the intriguing looking antiques shop and cafe near the station, let alone time to venture into the village or find the pub. 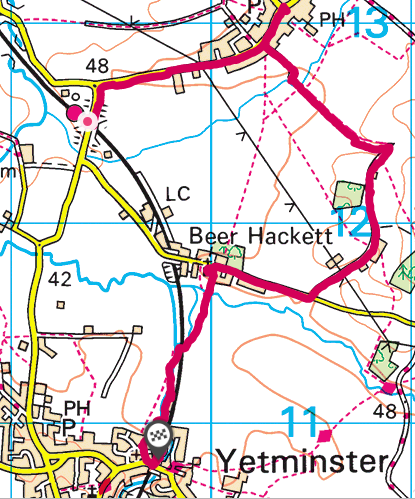 I am planning a walk from Chetnole to Yetminster, so hopefully I may have more opportunity next time. I did get to hear the distinctive chime of the church clock. Every three hours, it plays the national anthem! Yetminster station itself is small and lacking in facilities, but was clearly larger in the past. I don’t know when the second platform closed, nor the enormous derelict Railway Inn right beside the platform. I rather like the concrete stairways down to the platform from the road. 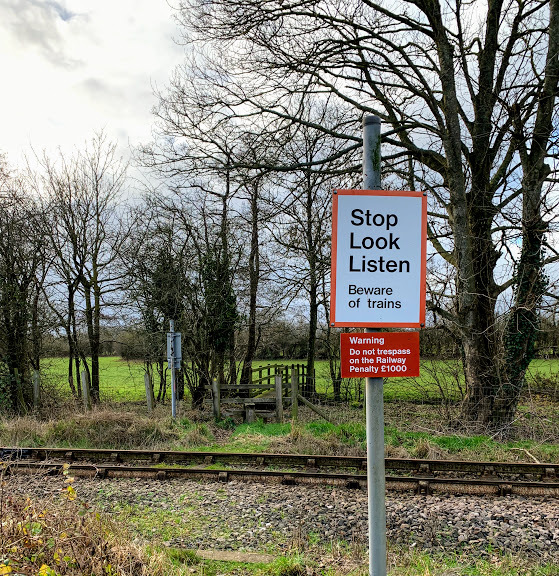 Yetminster is another request stop, twice as well used as Thornford. Yet again, I was not alone in signalling clearly to the driver. 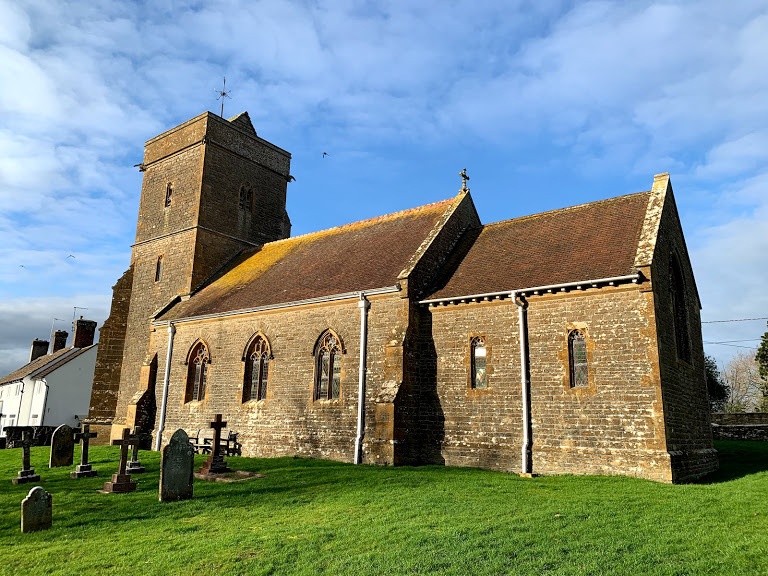 All in all, a very pleasant walk, although I wish I had not dawdled so much at the beginning to give me more time in Yetminster.